As your little one grows up, you'll be able to do more activities together, like eating out. But what if her manners just aren't up to scratch yet? Take a look at Dining Out to learn how to make those dining experiences more enjoyable. Now that your child is starting school, you'll want to help them with many different skills. 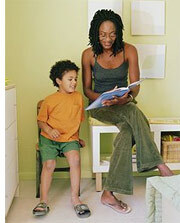 Help him learn more about empathy along with other social skills. Let him get a head start at school by teaching him some problem solving skills. And when it comes to go to preschool, make sure you choose the best one for your child by reading Choosing the Right Preschool. Not sure about whether to send your child to preschool or daycare? Learn about the differences between these childcare options in our Choosing Between Preschool and Daycare section in order to make the best decision for your child. Worried about how your child will adapt to starting preschool? Check out our section on Helping Your Child Adjust to Preschool, which provides helpful tips on getting your child excited about starting school. Concerned on how to help your child cope with the death of a loved one or the loss of a pet? Read our article Helping Children Cope with the Death of a Pet to see the steps you can take to make this grieving time easier for your child by being supportive and understanding. And it's never too late to start teaching your child about stranger safety.